As I’ve mentioned a few times now, I’m on a really big Malaysian kick – dragging TC and DLS along with me to various Malaysian restaurants around the city. 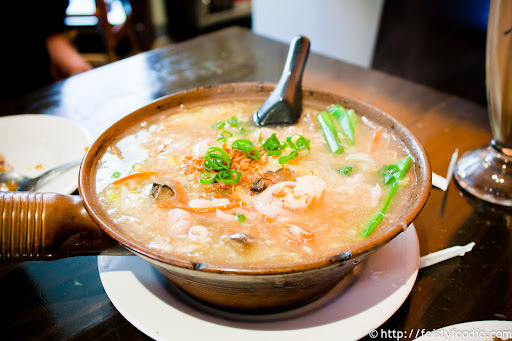 This time, TC and I returned to Penang – where we’ve both been multiple times in the past – and ordered some different dishes. For TC, har mee or udang mee, which was not spicy enough and not nearly as red as the version seen at Satay. He thought it was only OK, sadly. 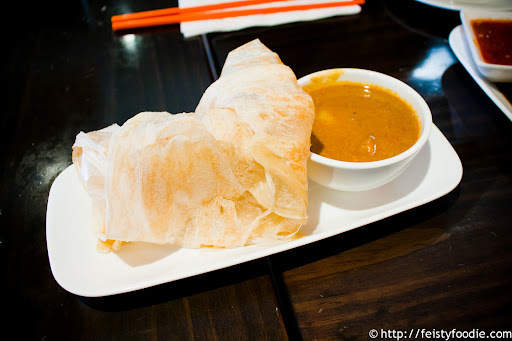 An order of roti canai, as is my usual. Crisp, pillowy, chewy, and just all around great, I do really enjoy their version. 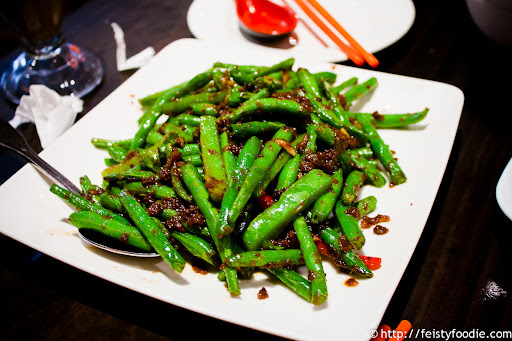 Trying to be healthy, we went with green beans sauteed with belacan – slightly spicy but very flavorful, lots of umami taste from the ground shrimp paste. Really good and properly cooked, I enjoyed this a lot. And for me, I forget the name of this dish (TC, help?!) but it was basically udon stir fried in a soy sauce gravy. I really enjoyed it, even if he chided me for it not being a real Malaysian dish… and not particularly unique, haha. Still very tasty! 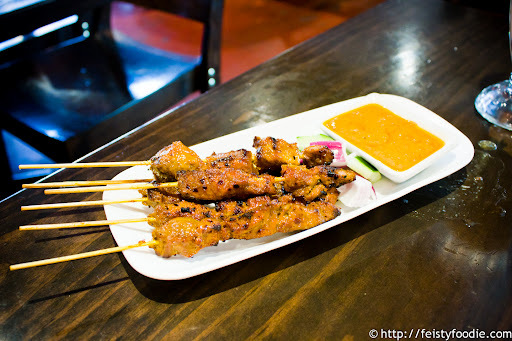 Last but not least, our beef satay, which was meaty, tender, fragrant and really good. I enjoyed it a lot! Funny enough, a few short weeks later, FeistyMom wanted Malaysian for her birthday, so Snorlax, FeistyMom and I headed to the same location for dinner. We ordered half a Hainanese chicken; the meat was slightly warm, and FeistyMom suggested it was freshly poached (this is a dish normally served cold). To no detriment here – the white meat was juicy, tender and delicious – and you know I don’t eat white meat normally, but I found myself gobbling this up. Fantastic; I’ll have to order it by the half more often… so good. 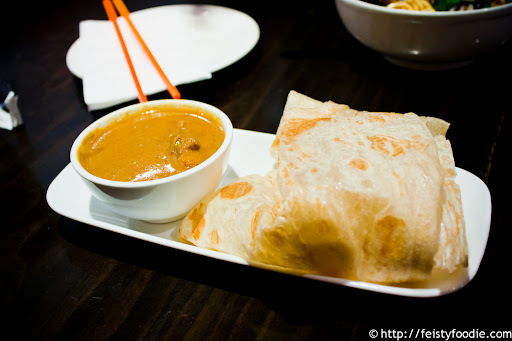 As I said, my standard order of roti canai, and it was great as usual. My choice of char kway teow went mostly ignored in favor of the other noodle dishes. I asked for this to be slightly spicy, and it was pretty spicy for my sensitive palate.. but still good. Snorlax requested and received ‘wat dahn ho fun’ or something (slippery egg broad noodles) – underneath the pool of sauce, which has a beaten raw egg mixed into it, are stir-fried broad white rice noodles. Though those fake-crab looking sticks on the side were awful (tasted like rice cakes but bad), the rest of the dish was absolutely delicious. We both had a lot of fun ‘fighting’ over bits from the plate, and just eating this happily… so good. Then our beef satay came out; the only fail of the night. These were mushy and tasted OFF, like weird and bad. We did not eat more than a few bites each before we decided it wasn’t worth the stomach space; sadly, FeistyMom suggested something had gone wrong with the dish or maybe it’d turned. Regardless, the rest of the dishes were so great that I didn’t really notice the lack of satay in my belly that night. As you can see, I visit Penang fairly frequently and really enjoy it; I don’t foresee that changing any time soon. That location has been there for a while, and while the quality has been inconsistent over the 15 years I’ve been visiting – I think they had a bad chef at one point, who appears to no longer work there – it’s now returned to serving some really excellent food. I’m already planning my return visit! 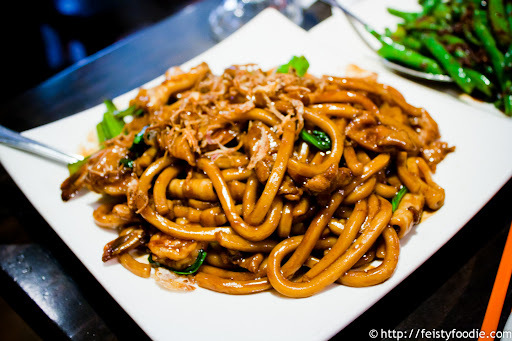 Clay pot noodles, yum! What is your roti with? Curried something? I wouldn’t mind that har mee either, spiciness lacking and everything. If I come to Queens I’ll need pho too. It’s right next to Yvo’s favorite pho place so you could do pho AND malayasian. Aight, Penang trip sometime. Let me know. Probably not this week though. Gotta get ready to avoid Zombies from eating my brain (my race). HA. 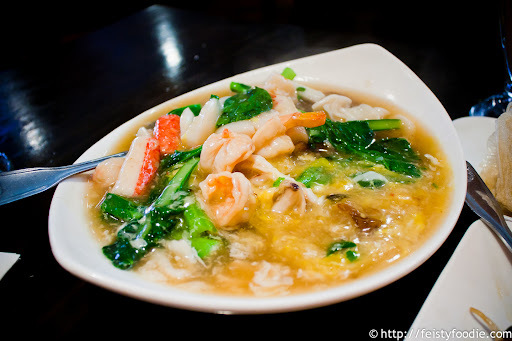 Is the char kway teow same as pearl noodles? The kind that rolled with the hands to form an oblong shape? 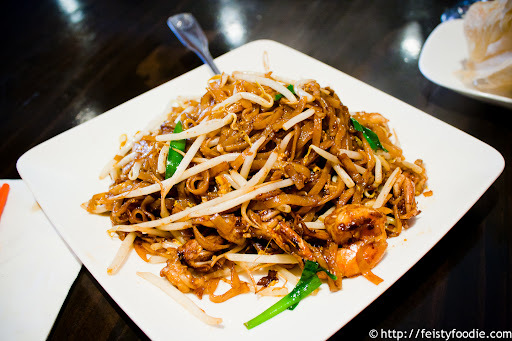 Char kway teow are the thin flat rice noodles/hor fun. Pearl noodles are thicker and wormy stranded noodles. 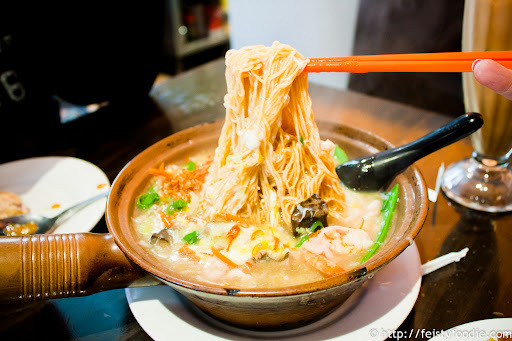 Penang has a fried pearl noodles dish too. I can’t recall the last time I eaten those silky strands though. Ah okay. Pearl noodles are my favorite. TC answered for me already, haha. Udang Mee was definitely lacking that day. It’s seen better days. A few summers ago when I ordered it, it was flavorful, and super red. Delicious! 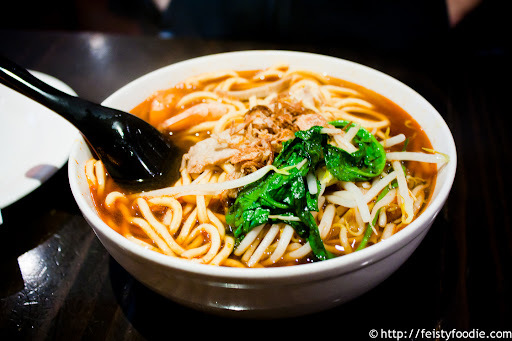 I have no problem with it not being very spicy since the broth always varied but the flavor was an issue to me. I saw a Penang when I was down in Vegas this past weekend and was CRAVING! But I thought I’d try some other places out and leave Penang for when I am back in Jersey in June. 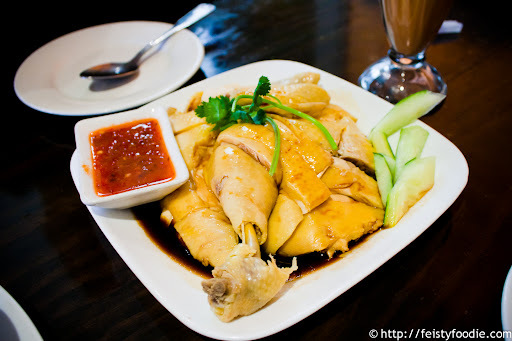 I always order a Roti Canai and half a Hainanese chicken with coconut rice. 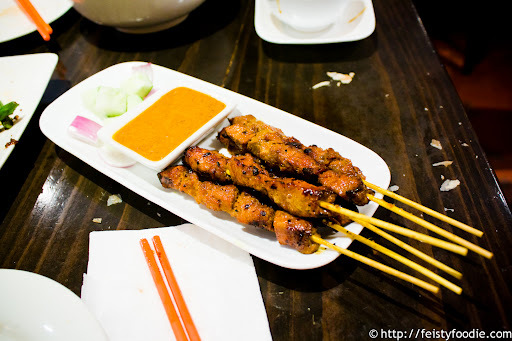 Sometimes I’ll order some half beef/half chicken satays and the satay tofu. And I finish off with some bo bo cha cha!